It has been popular with Spanish holiday-makers since the 1970’s but the Spanish property boom of the late 90’s and early 2000’s irreversibly changed Cabo Roig with an influx of new money and a new population. Cabo Roig has two main blue flag beaches; Cala Capitan beach is the larger one, and the second one is the self named Cabo Roig beach, (also known as Cala Caleta Beach) joined together by the stunning Cabo Roig cliff walk. Cala Capitan beach is a family friendly beach due to the lagoon like area where the water barely rises above 12 inches for fifty meters or so into the Mediterranean. Both beaches are well looked after by the life guards and staff of the Chiringuito Beach bar who provide food, drinks and loungers under the umbrellas for those looking to get out of the sunshine even temporarily. They also provide lockers for safe keeping of valuables. People who are here on holiday just love this beach with its views right to Punta Prima and Torrevieja. For safety, and to keep their blue flag status, the beaches of Cabo Roig are both protected by lifeguards – a good thing as there is a always a severe undercurrent in this part of the Mediterranean. Please be careful! Torre Vigia, a Watchtower, looks over the Mediterranean coast, and is a very dominant structure, not to mention an historic one in Cabo Roig. This tower is part of the network of lookout towers built along the Spanish coast to protect against Berber pirate raids which persisted right into the 17th century. It’s likely that in the mid 12th century, Cabo Roig was an Arabic site but the stone built tower was placed here in the 16th century to ironically protect against Arab raids. The Berber pirates attacked the south of Spain from the 13th to the 17th century.They had been displaced from what they considered to be their homes by the Spanish and sent to Granada and therefore they took to the sea to become pirates, pillaging the towns of the Spanish coast and even taking the Spanish people as captives and as slaves. The network of towers were all connected visually. They were the first line of defence, when one tower suspected a threat was imminent they lit a fire, and the white smoke raised the alarm in the neighbouring towers and the word of attack was passed along the Costa Blanca right up to Alicante. Also, the residents within view of the towers were informed of pirate ships on the horizon immediately, giving them time to make a hasty retreat! These days the Torre Vigia is a lot more peaceful. It has become part of the Cabo Roig La Bahia Restaurant. This typical Spanish restaurant serves tapas, beers, full course meals with views over the Cabo Roig marina and right across the sea, just like it did all those years ago. The restaurant is well worth a visit, if only for the view alone. The service, let’s be honest, is not fantastic; the vista however…. spectacular. The scenery around Cabo Roig, as you would expect with a piece of land jutting out into the sea, is dominated by the Mediterranean. 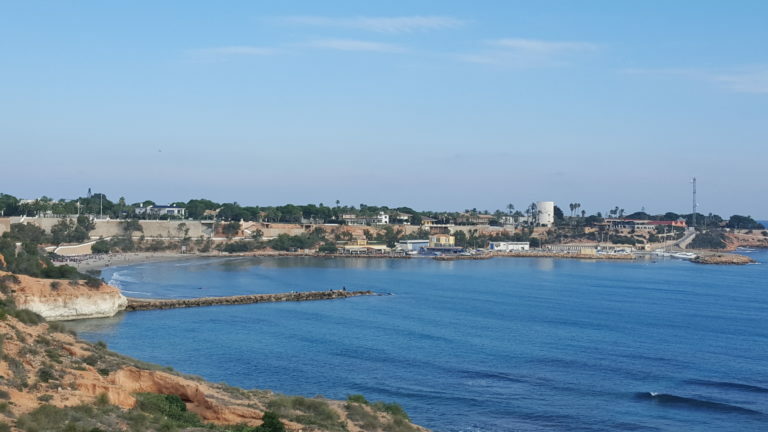 We’ve mentioned the Cabo Roig tower as a site that you really should visit if only for the views over the entire bay area right the way to La Manga. It’s also an access point to the La Zenia/Cabo Roig cliff walk. If you have the legs for it, do it. It’ll take you 20 minutes to reach La Zenia literally all the way on the cliff and beaches. It’s a cobbled surface so not perfect for bikes (in fact it’s one of the few routes on the whole Orihuela Costa cycling is frowned upon) but its easy on the feet at least. If you wish to continue walking to Playa Flamenca, the route goes past the La Zenia hotel and you can go all the way to Punta Prima. Regardless of the humour of the sea on that day- It’s a beautiful stretch of beach walkway. On a windy day with the waves crashing up to the cliff it’s something special, on a calm day with the sea looking like a mirror, it’s maybe the most relaxing place in the world! Fishing is particularly favourable with the Spanish, casting off from the shore. Boats, with skippers, can be organised for sea fishing trips, parties, romantic evenings, corporate events etc. Generally booze and a BBQ will be provide on request too. This is one of the top real Irish bars on the Costa Blanca- We say real Irish bar as it’s run by a real Irish family from Co. Waterford in Ireland. Jim, Ger and Paul along with Caoimhe have been here for close to ten years now and that is not common in the bar game these days. The service is spot on; always a smile for every customer, the pint of Guinness is good, the atmosphere always fun, and as they are such huge sports fans themselves, pretty much every game is on the TV all the time. They run a very popular golf society, they have music most, or in fact maybe all nights and it’s a top spot to have a beer on the Cabo Roig strip. There is a great selection of Italian restaurants on the Cabo Roig strip; Puccinis, The Italian Affair and our particular favourite, Piccolino’s Italian restaurant. The service is great, Gio, the boss man, is quite the entertainer. It’s possibly the best pizza I’ve ever had in Spain- perhaps it’s because you can see it being made from start to finish. Another thing I like is that the family all work here and they are super friendly. I’m not sure if it’s policy but I’ve noticed while people are waiting for their take away pizza, Gio will give them a complimentary drink – just another nice touch! One of the older established restaurants in Cabo Roig, Beef or Salmon is always good. It’s just one of those restaurants where you know in advance what you are going to get- Fast friendly service from Mary and crew and consistently good food. So many of the restaurants on the Costa Blanca could learn so much by just watching what they do here. It’s reasonably priced too and the house speciality, if you are hungry and able for it is a must-try. Funnily enough the speciality is "Beef and Salmon”!! This is a new addition to the Cabo Roig Strip, opened by award winning chef Peter in the summer of 2015. Peter also runs the "Numbar 5” fine dining restaurant but we picked this for our top five list due to its easiness! Literally diners can flop onto the sofa and order fairly simple food- huge sandwiches, burgers and great breakfasts while watching the sports on TV. The Sofa Bar also serves late at night- right past 2am during the summer and it’s a great alternative to a more dress up evening meal. Yes, I know this is two bars but I only have room to write about five places so I’m running these two in together as they are pretty much side by side in the Cabo Roig Marina. The clipper is the smaller one- its only got a few tables right in front of the marina. It’s such a lovely place for a glass of vino, coffee or an ice cream especially in the evenings when the sun is setting and the leisure boats are returning from their day on the Mediterranean. If you ask the waiter politely, he’ll give the kids some stale bread to throw into the sea to feed the already very well feed fish! The Bahia is the bigger bar/restaurant to side of the Clipper with lots tables inside and outside. They do full course meals, kids meals, tapas, drinks, live music at night and as it’s right on the sea, it’s such a wonderful location. In fact, the location may be better than the restaurant quality itself and its a little pricey but it’s totally worth it however for a different sort of night out. 6.STELLA MARIS, SAILING CLUB, CABO ROIG. Although tragically badly marketed, the Stella Maris in Cabo Roig has many great activites for young and old that are worth checking out. 7. KIDS SAILING COURSES ARE IN JULY AND AUGUST. The price for a week is 140 € per child, 5 days per week, 3 hours each day (from Tuesday to Saturday, from 10:00-13:00h). Maximum groups of 6 children. They are all the time with a monitor who take care of them, teach them the basics etc. Children are required to be 5 or more years old. The price for a family is 500 € per week, it doesn’t matter if the family has are 4 or 5 members. 70 /20 min (It could be outside the circuit, organized trip with a monitor who is in charge of a group of people. They go a bit further away). They’re waiting for some changes in the law. Once it is possible foreign people can get a licence here in Spain, with a deposit of 3000 € and 200€ per month, and motos could be used freely and taken as far away form Cabo Roig as you wish- This might be available in 2016, we just don’t know yet. * Sailing Licences for adults.